A new short film titled Fearbook has won the Best Horror Film award at the Los Angeles Independent Film Festival held recently. 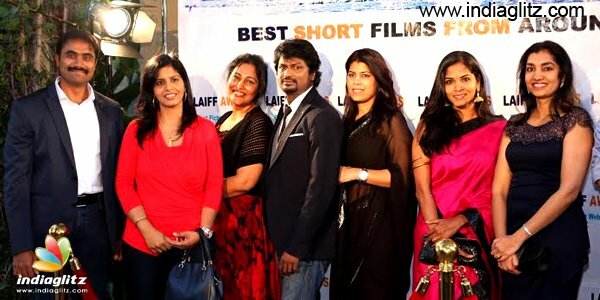 “‘Fearbook’ is the first Tamil/Indian short film won this award in Horror category and I was thrilled to be there representing the ‘Fearbook’ team!” said the film’s writer-director Kums Sandran. The film has been produced by Kokila Jayaraman. The technical team comprised of music director Deepan, Cinematographer Rajaraman and Prasad Rajaraman and editor Athiappan Siva who has worked as Editor in Kollywood film ‘Moodar Koodam’, ‘Kedi Billa Killadi Ranga’ and ‘Marina’. TamilGlitz wishes the ‘Fearbook’ team for their marvellous achievement.